Sort of fooled ya there. The above image is not one of the covers. It was rejected, and I can see why. I really like it, but it doesn’t fit the book at all. The cover for the dark Lemons Never Lie makes it look like a happy-go-lucky slapstick caper. This bugs me, probably more than it should. But for now, this one’s only digital, so you who still buy paperbacks will get R. B. Farrell’s perfect cover done for Hard Case Crime instead. On the other hand, The Blackbird and The Dame are fine. Both capture the feel of the book quite nicely, even if the wilderness shot on The Blackbird cover cheats a little by being sans snow. The Damsel is almost there. Is that Mexico City? I don’t know, never been. But it looks too modern. Give me a shot of 1967 Mexico City instead (if not a shot of whatever they were drinking there and then). Those are my thoughts. Yours? Speaking as an ex-graphic designer, I think these work really well. Simpler and more attractive looking than the Parker ones, in my opinion. Especially like the device with the ‘Richard Stark’ name wrapped around the girl’s waist like a towel. Admittedly, Lemons Never Lie could have been a little more hard-boiled, but the others all work (although I’ve never actually read The Dame or The Blackbird). Also, if you check out Amazon, they’ve got the final covers and the definite article from The Blackbird has been restored. Those covers are awful. I prefer the Parkers. 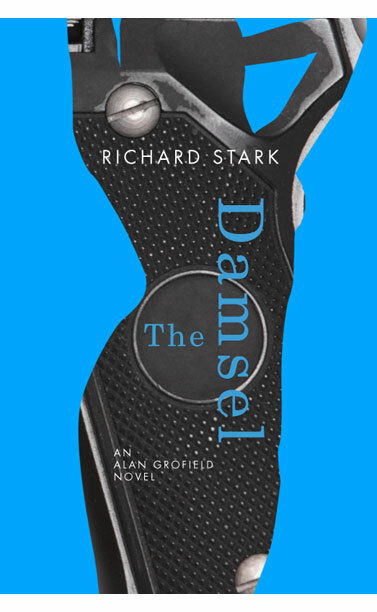 Given that 3 of the 4 books involve Grofield running around with a random female in tow, I understand the woman silhouette is fitting, but I hate the way the titles and Stark’s name are printed. Won’t stop me from buying them. I’m eternally grateful that the UofC Press is doing these! Seems to me that the covers are to modern and not of the time period that the Grofield’s were written. Thanks for that link, Matthew! Would have missed it otherwise. Cooke’s a pretty easy guy to talk to, and loves to chat about DEW.